A Derrick crane is a mast crane and top of the mast is fixed with the back braces (stiff legs). The mast and a jib are fastened to a slewing platform. The mechanical and electrical equipment to power the crane is also in the back of the crane. The mast, jib and stiff legs are designed as a truss with a square section. The derrick crane is fixed and is mounted on a platform. Derrick cranes usually have three mounting points, the base of the mast and bottom of the stiff legs. The angle between the stiff legs is 90°. 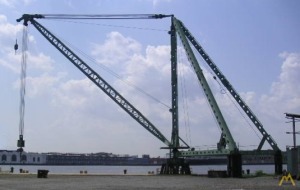 A hinged joint of the jib and legs ensures the slewing and lift motions of the jib.